Web 2.0 applications are becoming ubiquitous applications (i.e., applications that can be accessed by anyone, anywhere, anytime, using any device). A key element of these ubiquitous applications is mobile devices. In fact, the involvement of mobile devices such as smartphones and tablet computers in the development of Web 2.0 applications has resulted in a new kind of Rich Internet Application (RIA) that can run on a variety of devices starting from the same code base, and it is known as multi-device RIA. The term multi-device RIA embraces not only mobile applications but also other kinds of out-of-browser applications such as cross-platform desktop applications as well as the traditional cross-browser Web applications. 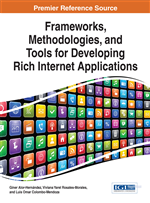 This chapter formalizes the concept of multi-device RIA, and then it presents an overview of the capabilities of several multi-device development frameworks. This review is finally summarized in a comparative analysis. Mobile devices such as smartphones and tablet computers have recently been involved in RIAs development because of the ubiquitous requirements of Web 2.0 applications (Kappel et al., 2003). In this sense, RIAs are known as multi-device RIAs. This term covers RIAs that run as cross-browser Web applications, cross-platform desktop applications and applications for diverse mobile devices. The operating systems on mobile devices have increased in number of ways in the last couple of years. These devices are becoming more integrated with the same functionalities of a small computer. Among the variety of operating systems for mobile devices are: Android™ developed by Google™ Inc.; iOS™ developed by Apple™ Inc.; and Windows™ Phone developed by Microsoft™ to mention but a few. A brief description of the most popular mobile operating systems is presented below.